The Star Performer lets kids turn any television into an instant hit show by putting the power of performance right into their hands. Using Plug and Play technology the hardware unit plugs right into the TV. Then the power truly is in their hands as kids control the action. 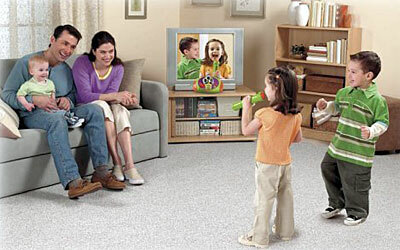 It comes complete with a camera to display the kids on the TV screen. The Star Performer Platform's music library lets kids choose from over seventy-five Kidz Bop songs -- popular songs sung by kids for kids. There are four songs built into the hardware unit and there is a library of nine additional ROM packs each containing eight songs. The additional ROMs make it easy for kids to quickly and easily change the music and the theme of their show. A wireless microphone puts no limits on the action and lets kids to choose from and control five different camera lenses. From a button on the mic children can change and rotate the lenses for on-screen effects.